Aishwarya opted for Abu Jani and Sandeep Khosla creation – a black gown with pleated tulle and gold embellishments. Aaradhya, on the other hand, looked cute in a pink dress with a red floral headband. Aishwarya Rai Bachchan was honoured with the inaugural Meryl Streep Award for Excellence at the first Women in Film and Television India Awards held in Washington DC. 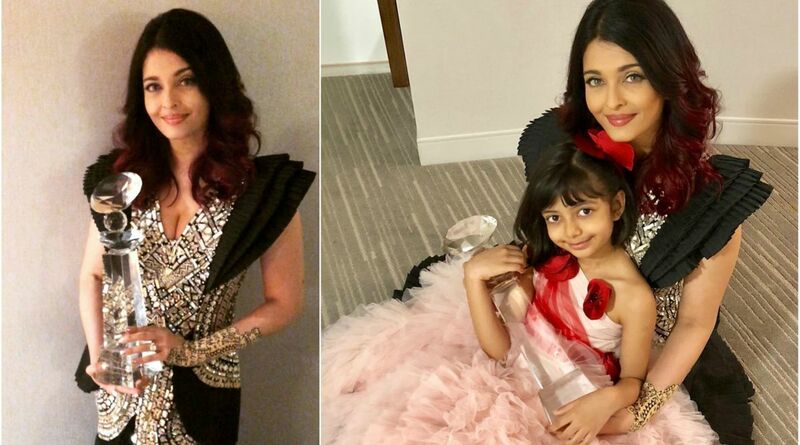 She was accompanied to the event by her daughter Aaradhya and mother Brinda Rai. Aishwarya shared the pictures from the event on her Instagram handle. She also posted a few pictures in which she can be seen holding a trophy in her hand and her daughter and mother beside her. Apart from Aishwarya, Bollywood newbie Janhvi Kapoor, too, attended the awards ceremony. She won the WIFT Emerald Award for her debut in Dhadak. In photographs, Janhvi is seen exchanging pleasantries with Aishwarya. Filmmaker Zoya Akhtar won the Wyler Award for Excellence in Direction. WIFT India is a network which promotes professional development and achievement for women in the film industry. WIFT honours the best female talent in Bollywood and Hollywood.